After a series of alien attacks, the DEO soon discover that a bounty has been placed on Supergirl, making the city a target for more attacks. By order of the president, J’onn orders Kara to lay low to prevent an intergalactic crisis, and Mon-El later accuses his parents of setting the bounty to have him leave Earth. Although they deny it, J’onn interrogates a telepathic alien who attacked Kara using Mon-El and discovers that Rhea did indeed place the bounty. 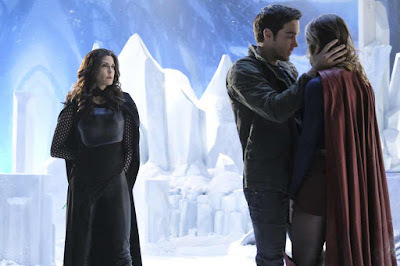 Kara convinces Mon-El to speak with his mother to appeal to her better side in the Fortress of Solitude, but Rhea soon turns on them, using a kryptonite dagger to harm Kara. With this threat, Mon-El agrees to leave. Meanwhile, Alex and Maggie go through a rough patch after encountering Maggie’s ex Emily. When Alex confronts Emily on ignoring an invitation to meet with them, she reveals that Maggie had previously cheated on her during their relationship. Rhea imprisons Mon-El as they plan to leave Earth. The DEO team then uses the Cadmus portal to enter the Daxamite ship and fight off Rhea. J’onn initially disguises himself as Kara to fight off the kryptonite, but Kara quickly enters the fray to save him. Winn secretly enters and releases Mon-El, but Kara is weakened in the fight. In seeing Mon-El show concern for Kara and J’onn, Lar Gand stops his wife and allows Mon-El to return to Earth, sensing his own happiness. Meanwhile, Alex and Maggie talk about Emily as Alex accepts the past so long as Maggie can begin to trust her. J’onn awaits his consequences for going against orders from the President who is revealed to be an alien in disguise. As the Daxamite ship begins to leave, Rhea kills Lar Gand for betraying her, vowing that she isn’t finished with Earth. The portal Kara uses comes from the episode “Supergirl Lives” which was also directed by Kevin Smith. Mon-El makes a reference to both Romeo & Juliet and Star Wars. President Marsdin is revealed to be a Durlan a shape-shifting alien similar to Chameleon Boy, a member of the Legion of Super-Heroes. A new villain from the 64th century named Abra Kadabra attacks Stagg Industries, forcing Gypsy to return to return him the Earth-19. When Kadabra attacks STAR Labs, Barry captures him, but the villain offers an ultimatum: if he is set free, he will reveal Savitar’s identity with his knowledge from the future. 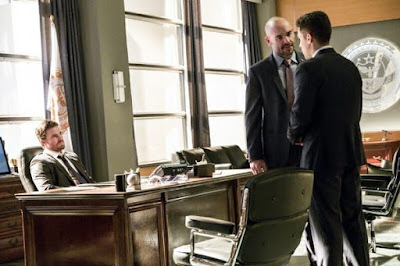 Gypsy allows Barry to interrogate Kadabra, but when Joe goes to speak with him to save Iris, Kadabra escapes and sets off an explosion against Joe, Caitlin, and Julian. The explosion leaves Caitlin forcibly wounded but, since they are unable to go to a hospital without revealing her status as a meta, Julian is forced to perform in-house surgery as Caitlin guides him. Upon Kadabra’s escape, Gypsy reveals that she previously had a partner who was murdered by the villain and theorizes that the technology that he is stealing will be used to make a time machine for him to return to the future. Barry, Wally, and Cisco then chase Kadabra in wormholes throughout the city as he attempts to use his machine. Barry then phases through the machine to apprehend Kadabra and return him to Gypsy for custody in Earth-19. Before leaving, Kadabra warns Barry about how they remain enemies even in the future. While they still do not know the identity of Savitar, Barry reveals his new plan to Iris: to travel to the future to learn about Savitar himself. Though Caitlin’s surgery appears to go fine, she soon seizes up and eventually goes into cardiac arrest. In a desperate attempt to save her life, Julian removes her power inhibitor to restart her metahuman abilities. While her powers are able to heal her injuries, they cause her to lash against Julian and Cisco, turning her into Killer Frost. Stagg Industries is most known for the industry that created Metamorpho. 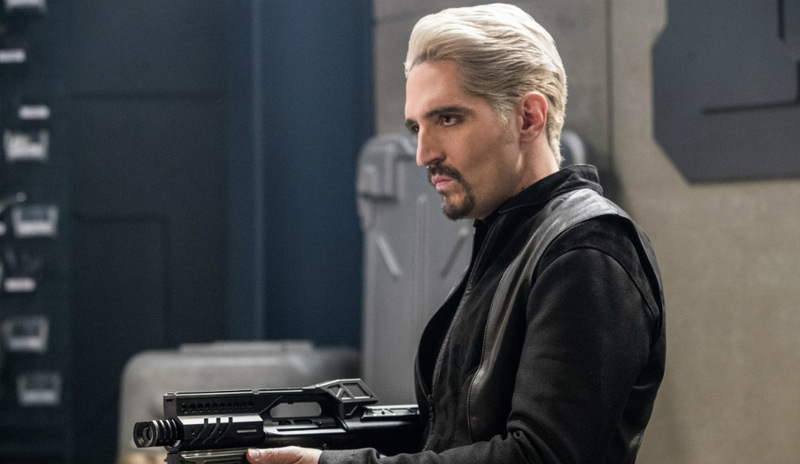 Kadabra references DeVoe as an enemy of the Flash, possibly referencing Clifford DeVoe, the Thinker. In a world run by the Legion of Doom, Darhk acts as mayor for Star City with Merlyn maintaining his wealth and Thawne running STAR Labs. Jax, Stein, and Ray work for Thawne, Sara and Amaya hunt down vigilantes for Darhk, and Rip remains stuck on the Waverider baking cakes. Though the Legion are successful, Darhk and Merlyn remain distrustful of Thawne, especially as Mick shows signs of regret. Soon, Nate arrives and attempts to explain his theory of time scars to this reality, leading Mick to rescue him and reveal the truth. Together, they find Ray and use his recent invention to regain their memories of the previous reality. After being attacked by Sara and Amaya, the three are able to regain Sara and regroup on a plan to find the others. Meanwhile, Stein works on a device for Thawne that the villain plans to use to destroy the Spear of Destiny and maintain this reality. To retrieve the Spear of Destiny, the team infiltrate the headquarters and attack, just as Darhk and Merlyn plan to take the Spear for themselves from Thawne. Unfortunately, Stein destroys Ray’s device out of distrust for Jax, preventing him from joining. Mick blasts the Spear from Thawne for a restored Amaya to use to fix reality. 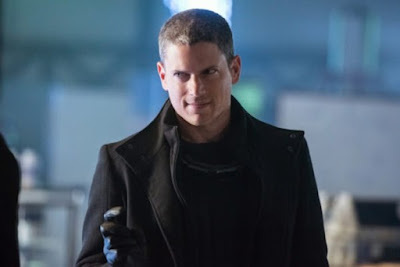 However, Snart then freezes and kills her with his gun, returning the Spear to Thawne. Thawne then destroys the Spear, allowing the others to live only to realize how fruitless their efforts have been. Regrouping, Sara suggests returning to 1916 to prevent the Spear from landing in the Legion’s hands, but they still have no idea where Rip or the Waverider could be. Fortunately, Rip puts out a distress signal on the fixed ship to find the others, revealing to be trapped miniaturized on Thawne’s desk in STAR Labs. Sara and Amaya hunt down a vigilante version of Felicity Smoak in the opening scene. The Legion of Doom headquarters resembles the same one used in the original Superfriends cartoon. The video game Ray plays is based on the Invasion! Crossover storyline. Oliver disbands the team, despite the others not accepting the news. Instead, Diggle and Felicity work to catch Chase with Felicity using Helix technology to find proof on his real identity as Prometheus. With the inability to stop Chase, Oliver is forced to watch him go free and breaks up with Susan, believing him to be toxic to people around him. In order to try and stop Chase’s killing spree, Oliver is forced to look for help from Anatoly and the Bratva. In exchange for stopping Chase, Oliver allows the group to steal diabetic drugs to create a new street drug in the city. Against Oliver’s wishes, Diggle and the team interfere with capturing Chase but fail to stop the villain. 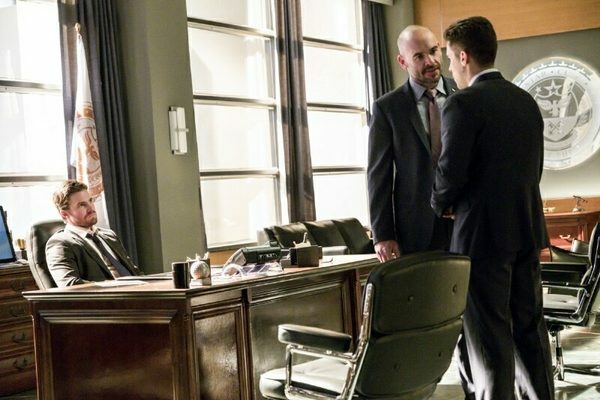 Five years ago in Russia, Oliver reveals his plan to return to Lian Yu to Anatoly, but Anatoly requests Oliver’s help in securing drugs for the Bratva, believing Oliver to be a good man by his side. Diggle soon convinces Oliver to help them take down Chase the right way, believing that the team can help Oliver move on from the past. Unfortunately, Anatoly refuses to back down from their deal. Together, the team breaks into an industry building to find the Bratva, leading to Oliver and Anatoly at a standoff. Despite their past relationship, Oliver sets off an alarm, forcing both men to leave on separate sides. Felicity secures proof that Chase is Prometheus, leading Oliver to restart the team with a renewed sense of purpose. Diggle and Dinah then deliver the information to the SCPD which renegades on Chase’s protection deal and seeks out his arrest. Despite being wanted, Chase kills the US marshals who are after his arrest and heads back to Star City. The team breaks into Kord Industries named after Ted Kord, one of the figures behind the Blue Beetle. Comic Book Review: Batman #21 "The Button, Pt.1"
The Geekcap Roundup: Agents of S.H.I.E.L.D.